UPDATE 2015 > Scroll all the way down and you can read an update regarding all this in 2015. 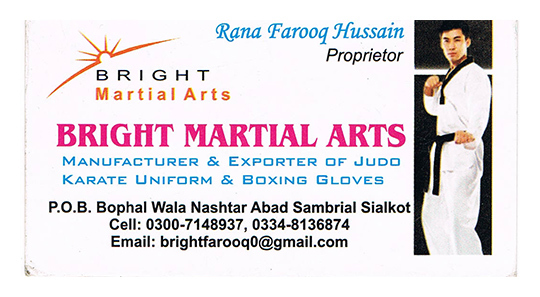 If you’re thinking about doing business with Farooq Bright from Pakistan Sialkot (Bright Martial Arts) then please read this post first and then decide whether you want to throw your money away or not. Following are the details of the company and owner so you know exactly whether you have the right person or not. [29/05/2013 8:25:23 PM] tacofleur: can you type? [29/05/2013 8:26:24 PM] tacofleur: you there? [29/05/2013 8:27:09 PM] tacofleur: can you type? [29/05/2013 8:27:53 PM] tacofleur: Hello!? [29/05/2013 8:28:19 PM] tacofleur: do you have a problem typing? [23/08/2013 10:43:38 AM] tacofleur: when will the order be send? [23/08/2013 10:44:16 AM] tacofleur: Next month? what date? 1st of September? [23/08/2013 10:51:59 AM] tacofleur: what date will I have the order on my doorstep? [23/08/2013 10:59:14 AM] tacofleur: I am saying that you dissapoint me everytime, you never do what you promise and always have excuses, holiday, floods, forgot to sent the belts, etc. etc. [5/09/2013 7:26:07 PM] tacofleur: yes? [5/09/2013 7:26:12 PM] tacofleur: yes? [5/09/2013 7:28:17 PM] tacofleur: can you not read? [5/09/2013 7:30:28 PM] tacofleur: how can we have a face on with no camera or microphone??? [19/09/2013 11:33:47 AM] tacofleur: not mind about what? [19/09/2013 11:34:37 AM] tacofleur: are you serious? [19/09/2013 11:35:09 AM] tacofleur: ok what? [19/09/2013 11:35:27 AM] tacofleur: tell me what you need today! [19/09/2013 11:35:41 AM] tacofleur: you need sizes? [19/09/2013 11:36:01 AM] tacofleur: are you the same person as before? [19/09/2013 11:36:21 AM] tacofleur: ok what? [19/09/2013 11:38:01 AM] tacofleur: what is the trackong number? [19/09/2013 11:56:44 AM] master bjj: i just makes your logo . [19/09/2013 11:57:58 AM] tacofleur: do you have everything you need? do you need anything from me, ANYTHING? [19/09/2013 12:08:39 PM] tacofleur: do you need ANYTHING else from me? Besides the above skype chat, I have 100’s of emails going back and forth. Yes, I know, I’m dumb too for even trying ‘once again’ to do business with Pakistan or any other country in that area. More than a year later I receive an email from Farooq. I don’t invest too much time in the email as I’m skeptical as hell and know that this guy will not deliver anyway. I think what happened was that some of his customers told him about this post and he thought by PROMISING to deliver the order one year later I would remove this post. My reply. I will await my order you will send me that I paid for. Let me know if you need my new address. i was realy in big problem . A few more emails exchange, then I suggest to make things easy for him. Also, maybe it’s easier for you to just refund the money, rather than making the Gi’s, I’m happy with that as well. Also, once this is settled I can update the Google page (that’s what he calls this page) I wrote. He replies with the following. Note I have already provided him my address several times now. GUESS WHAT?! Today is the 12th of January 2015 and still nothing.